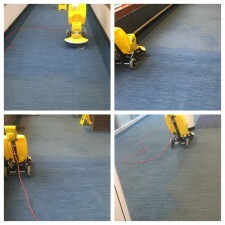 Carpet cleaning is important for any business or place of work. From that initial WOW factor that your customers and business partners get when they walk in, to the healthy indoor air environment you have helped to create by hiring us to clean your carpets. Regular carpet cleaning should be as important as having your office, kitchen or toilets cleaned. Have you ever walked into someone else's business premises and been greeted by dirty carpets? That is a missed opportunity to show how seriously they take their clients and colleagues. Look at our photos to see how we can benefit your work place. What can we do with your office carpets? Work at a time suitable to your business hours with our 24/7 availability. HKS carpet cleaning fact - regular maintenance cleaning plans for commercial carpets will save thousands of pounds versus the cost of replacing them as it will dramatically increase their life span.